← Mixed-Media Fiction: Sink or Swim? 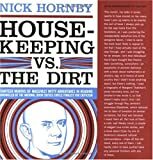 Hornby’s introductory essay for “Housekeeping vs. The Dirt” should be required reading for anyone who experiences any conflict in his/her reading life, and for any student or teacher of English/Literature. In the academic world, we are constantly made to feel bad if we don’t read a certain amount each month, if we haven’t read certain key books in the canon, if we spend more time with television or film or video games than we do with text, if we support one genre over the next, if (in short) we don’t make ourselves absolutely miserable for the sake of being “well-read.” We must speak of non-literary work as “guilty pleasures,” as if we’re not allowed to enjoy what we enjoy. Hornby’s essay succinctly defuses this argument, and it becomes a running theme throughout each of his personal essays throughout the book: “Housekeeping” is the name of a highly literary novel, a true treasure and a piece of art, and “The Dirt” is the name of a disgusting and dirty biography of Motley Crue, a book that no one could confuse as artwork. Is it possible to enjoy both? Can one find a balance in their reading lives between the artistic and that which is simply enjoyable? Can each enrich one’s life in a different way, or is literature the only type of text capable of enrichment? Hornby is always engaging, always entertaining, and always brings an average-man mentality to his work. Maybe a pretentious academic wouldn’t buy into his argument, but the majority of readers (those who appreciate art, but don’t think that sophistication should be the only thing to define their lives) can easily connect and relate. This isn’t a new argument, either, not necessarily, but never before has the line between “housekeeping” and “the dirt” been so blurred, with authors such as Michael Chabon deliberately writing so-called “genre novels” as follow-ups to Pulitzer Prize-winning fiction. With weekly television shows (“The Wire,” “The Sopranos”) and graphic novels recognized as literature. With Stephen King (formerly relegated to the depths of “genre writer” only) editing “The Best American Short Stories.” It might not be a brand-new argument, but it is an argument distinctively of our time, when more and more people are reading and writing than ever before, and when it becomes difficult to tell a 19-year-old who reads The Wall Street Journal online every morning, then writes a blog about how the economic collapse has affected his hopes for a future career, that this type of reading and writing is not good enough. Hornby is the right writer for this argument because he feels like one of us, and his essays–though mostly just conventional text–are also daring at times, rife with self-deprecation, and not afraid to use charts and other font sizes…it’s witty without being too proud of its own cleverness. This is indeed a book for a generation who realizes that our time is allowed to be split between dozens of different mediums, and who realizes that–just like the line between “Housekeeping” and “The Dirt”–the line between the elements composing those mediums (art, text, illustration, video) are blurring into a world where anything is possible in literature.